A neighbour’s cat adopted me last year. When she’s bored and I’m home, she visits. She gets a lap to nap on. I get a cat without kitty litter, cat food, or hair on everything. It also keeps her safe, during each brief visit, from becoming roadkill, eating or drinking noxious substances, and from stalking birds, squirrels, garter snakes and other garden wildlife. I’ve never seen her hunt, but why would she differ from other cats? Because Felix (or Felicia) the cat is deadly. When scientists from the Smithsonian Institute and the U.S. 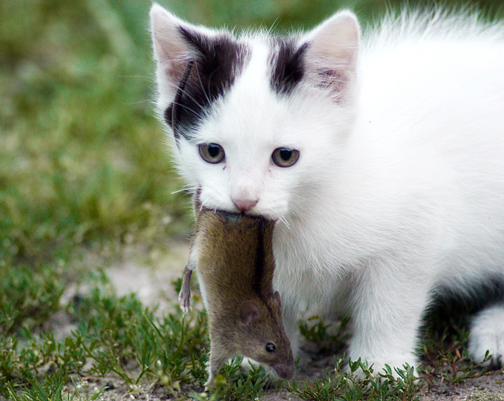 Fish and Wildlife Service scaled data from local surveys and studies to the national level last year, they estimated that domestic cats in the U.S. kill 2.4 billion birds and 12.3 billion mammals. Every year….